fudge which brightens up your day!!! Thanks Bev for the award and the recipe and for making my day!!!! oh...n see the many broken pieces?? mainly due to the fact that oil was used sparingly...health over whole strands of noodles, a small payoff nah?? 1. Cook soba according to package instructions. Drain and rinse under cold water. (the original recipe didn't call for this step..i rinse noodles/ pasta out of habit...used to do that at my mom's stall..it removes excess starch and makes the noodles more 'Q'/ al dente). Drizzle 1 tsp sesame oil on and mix well. 2. Blend seasoning for noodles in a food processor. (A whisk and bowl will do fine as well, just chop the coriander before adding.) Add to soba. 3. In a hot pan, add 2 tbs oil. Add eggplant and and fry for 7-10 mins or under tender and golden brown. 4. Heat 1 tbs oil, add spring onions, carrots, mushrooms and cabbage. Stir fry til soft. Add oyster sauce and sugar. Add eggplant. 5. Combine seasoned noodles and veggies. Recipe largely modified from Bay's Books 'best vegetarian dishes'. ** note about eggplant, i salted and rinsed it but it was still a little bitter and bitey... :(( why??? my favourite is chili-cumin..yum yum yum!!! 1. In a deep pan, (i used my non-stick stock pot) heat oil. 2. Add corn. Cover. Hold pot by the handle and shake vigorously side to side to ensure that corn kernels are coated with oil. Use a medium flame. 3. Wait for the glorious popping sounds and shake pot intermittently. 4. Popcorn is done when it is all quiet!!! Drizzle 2 tbs melted butter and stir briskly. Drizzle 1 tbs melted butter and stir briskly. Add 1/2 tsp salt, 1/2 tsp chilli powder, /2 tsp cumin powder. As for chili-cumin, but 1 tsp black pepper in lieu of cumin and chili. note: Toppings are for 100g of corn kernels ok...? This is a recipe i saw a couple of days ago on Piggy's cooking journal and decided to make it just cos i have all the ingredients....!! but unlike Piggy's, most of my mushrooms were of the dehydrated variety....dried wooden fungus (hei mu er), dried enoki mushrooms (first time trying them!! Not bad at all!! ), dried shiitake, dried lily flower (kim zam?? 'golden needles' in hokkien)..
3) Stir in chopped coriander, turn off heat. Add in cooked rice, stir until combined with mushrooms. 4) Serve with sliced cucumber and chili. These are basically frozen seedless green grapes...no sugar added..they are sweet enough...they are really fantastic....!!! Pop them into your mouth...guilt-free, cools you down n you are actually doing something good for your body to boot....(Go for 2 and 5!!)!!! They stay crisp for around 5 minutes and when they thaw, they turn sort of mushy..so don't wait too long to eat them ok??? and the result is fantastic!! So few ingredients; so much taste!!! Drop the bean sprouts into boiling water and boil 5 minutes. Drain well. Return to the pan. Stir in the salt, sesame seeds, sesame oil, garlic, cayenne, and green onions. Simmer 2 minutes. Cooked it today for my 'client'...and took the opportunity to update the picture. Season the chicken with 2 tsp light soya sauce, 2 tsp cornflour, 1 egg white. Stir well and marinate for at least 20 mins. Toss in garlic, ginger and peppercorns and fry for 1-2 mins. Add chicken and fry til 90% cooked. Add capsicum and gravy and stir fry til chicken is cooked (when you can cut through the meat quite easily). Add spring onion and nuts and stir through. Perhaps the editor of his ‘Cook with Jamie’ cookbook want the ‘instructions’ to sound as if Jamie is right there cooking with you…..ahh well… here’s the simplified version…I hope it does the dish justice..!! 1. Toast and grind up fennel seeds with mortar and pestle. 2. Heat oil gently in a pan. Add fennel seeds and chilli first, toss til fragrant. Add lemon zest, juice, fennel and crabmeat. Add salt and pepper to taste. Set aside. 3. Boil pasta according to package instructions. 4. Combine crab mixture and pasta, adding a bit cooking water or seasoning as necessary. 5. Dress asparagus with lemon juice, olive oil and salt. Sprawl all over on top with the reserved chilli and fennel tops. Serve immediately. And cos I misread the instructions, I combined the asparagus together with the fennel so all the shaving was in vain cos they just wilted….but next time I will do it properly…. Taste-wise…?? Really refreshing!! Can be served hot or cold I reckon…and would work equally well with octopus, squid or fish. This is a recipe which i m shortlisting for my future restaurant's menu!!! The pasta..which was accompanied by a simple salad, smoked snapper and turkish bread..
1. Preheat the oven to 200 degrees. Put the pumpkin, onion, garlic and rosemary in a roasting tin. 2. Drizzle with 1 tbs of the oil and the oil all over the ingredients until well coated. 3. Roast for 30 mins, or until the pumpkin is soft or starting to caremelise. 4. Cook the pasta in boiling water til al dente. 6. Add the garlic oil to the hot pasta, then the remaining ingredients. Toss well and season. My room feels like a sauna (dry heat, adelaide very arid)...it's just over 1 am now and i've spent the last 3 hours in the kitchen...where it is COOLER than my room.. Think it is supposed to be sort of a cooling beverage...just right for today's weather!!!! 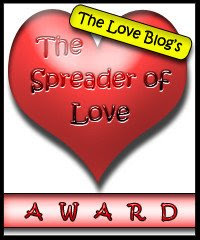 For spreading the love and being so generous with your time, words and expertise and making the blogging world a much lovelier place...i pass the award on to..
And to all the friends who drop by regularly, thanks for your support!!! to kiss or not to kiss...? aye........Curious Cook just wrote about a seinfield espiode inspired research...it is true!!! Double dipping IS unhygenic and transfers alot of bacteria!! So i tot...isn't it the same with the usual Chinese way of eating with chopsticks?? some people when they serve food to other people, use the opposite end of their chopsticks..but more commonly, u see people using their own chopsticks to eat from commual dishes.. I met someone special last December!!! My new friend is none other than V from easts meets west kitchen...she is like a very kind big sister to me...very generous and very nuturing....we spent many enjoyable hours talking about food, blogging and eating!!! And she brought along her two little girls...those girls, as Aunty Yochana rightly observed, melt your heart!! They are sooooooo adorable and clever!! 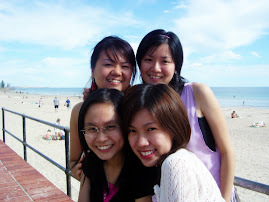 I really miss playing with them!!!! They are very humourous!!! I think it's cos V is very creative and secure...so her kids are very original... Love watching them dance and sing to their favourite mimi-daisy duck video and playing hide and seek with them...their 'ang-moh' accent is so endearing too...one of their pet phrases....: "Mom-Mee.....*pregnant pause*....I LOVE U!!" Everywhere we went, they solicited friendly smiles and everyone wanted to pet them or at least talk to them..! The world seems like a much nicer place when you have twins!!! ; ) V, you are so blessed!!!!! And thank you for everything!!! got the recipe from Little Corner of Mine...she's even posted a step by step guide. thanks LCOM for sharing the recipe!!! The ingredients are pretty simple but just take note to use a good quality coconut cream (Ayam brand is excellent) and cos i didn't have a microwave, i fried the tapioca starch with cut pandan leaves in a non-stick fry pan...how do u tell when it's done?? Hmm...not too sure too...just an approximation...maybe around 10 mins on low-medium heat..
they do take quite some time...the first batch took 3 hours but the second was around 40 minutes..most of the time was spent cutting out the dough. A bit late but here's wishing everyone a very prosperous Chinese New Year!!! May the year ahead bring many glad tidings!! happy chinese new year to 1 and all from singapore! I have not been cooking in Singapore as our food centres and restaurants here spoils me. Well to make up for it, i took pictures of the dessert i had with my family during reunion. Yes we did the uncoventional way, we had our dinner in an Italian restaurant as we feel chinese restaurants would not be able to cook up to standard for such a day. As a result we were the only chinese family dinning in that day. HA! The food is pricey but fantastic. See the warm chocolate cake, i think it cost S$25.00 but it taste heavenly! its full of good dark chocolate!! and am quite happy to report....success!! yay!!! and the meat wasn't that strong smelling too..
and then I thought I could use the bones for a third time..so i filled the pot to the brim again and left it to boil....went upstairs to my room and forgot all about it!!!!!! Soak 600g ox tail in water for an hour to let the blood out. Add around 3 litres of water and bring to boil. Simmer for 2 hours, skimming off scum about once a hour. most friends in australia know about my passion and have tasted my cooking some time or other but in Singapore, most of my friends have merely heard but infrequently eaten food that i make...not because i love them any less but the practical side of me doesn't think that it is cost/time efficient to make anything from scratch..
so when i phoned home the other day, i proudly declared to my mom that i was making bak kua...and her reply was: "bak kua can make at home???" Yar...can especially when you can't get it here and when it's going for fifty bucks a kg now that it's so close to the lunar new year.. Season ground pork with the marinate and leave in the fridge overnight or at least 4 hours. Oil a parchment paper generously and leave on baking tray. Spread meat on parchment paper evenly...i used my bare hands and flattened it evenly, around 3 mm thick. Bake in oven for 15 mins or until firm to the touch. Turn over carefully and brush generously with oil. Bake for another 15 mins. errr....interesting tidbit...the licorice root apparently lowers potassium levels in the body and the main preservative used be to be potassium nitrate...i wonder whether the licorice root is used to counteract the effects of the preservative?? ?